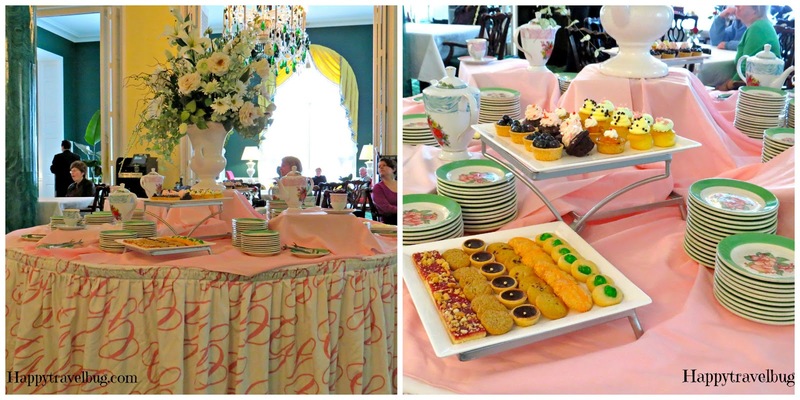 One of my favorite Greenbrier traditions is afternoon tea. It is served every afternoon in the Main Dining Room (to celebrate the Dining Room’s 100th year in service). This is the first time I have been able to share this experience with my kids. My daughter was totally into it, like me, and my son cared for it about as much as my husband does. 🙂 We went every day while we were staying at the Greenbrier. You can choose from hot or iced tea from this table below and then help yourself to the treats on the main table. Each tea starts with presenting the treats and a dance. I filmed this part for you to get a better idea of what it is like. Most of the treats are replenished after they are eaten, but there are a few things that they only bring out one time. I think this is why people go crazy in the beginning. I must admit, I have my favorite things that I try to get before they are all gone as well. My favorites are the blueberry tarts (which go fast and don’t come back), the scones with jam and cream (the most amazing cream on top..LOVE it), and the square cookies with crumbles on top (not sure what it is, but it’s yum). I have tried all of it…yes, it’s true, and it is all yummy. I just like some things better than others. Which one do you think would be your favorite? Oh wow…look at all those desserts!! they look amazing!! Those pastel colors are absolutely springtime in photos! I heard so much about the Greenbrier when I lived in DC and never made it. I could do with a spot of tea now, even though it's 10 pm here. Those desserts trays look so appetizing. The blueberry tarts would be my favourite, but I would like to try them all. Looks amazing! My wife and I love tea time; we just had one last fall in London that was incredible, but this one you have seems to have more food! 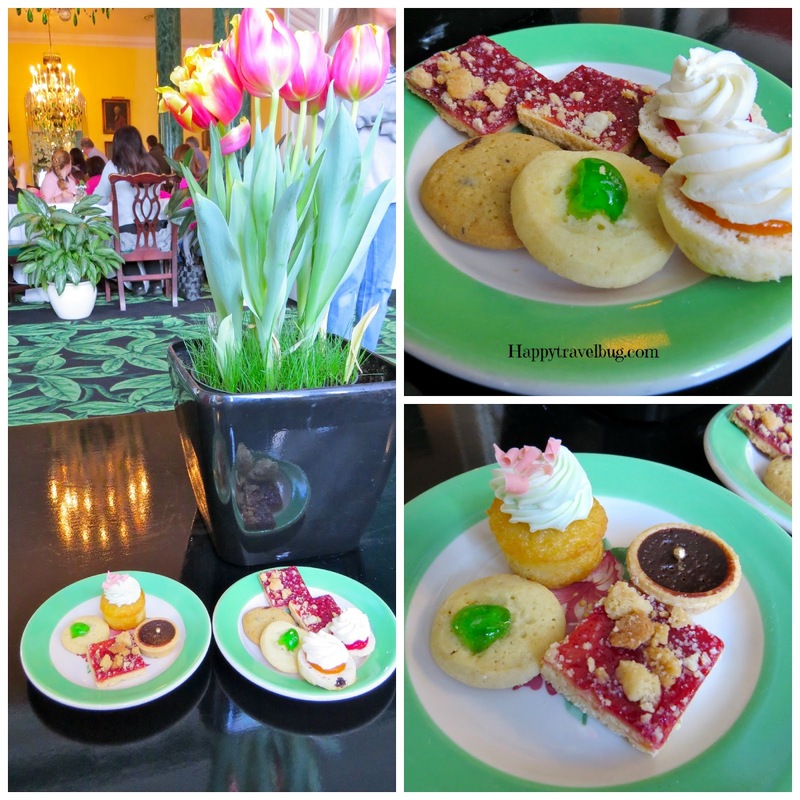 Oh, the Greenbrier! Thanks for this lovely tea. We spent a week there in 2001 to attend a special cooking school in which Julia Child was one of the guest chefs. It was a wonderful time. Thank you for that video, I feel as if I had really been there! What a lovely place. A favorite? The blueberry tart looks delicious and I love scones. The little chocolate cupcake also looks yummy and anything with peaches or apricots. My plate would be overflowing! So glad you liked the video…and yes, the Greenbrier is one of my favorite places to go. I'd love to go to the Greenbrier. I've heard such magnificent things. I admit I'm not much of a tea person but do like the whole tea time thing and love all the treats. The video is awesome! Love how they set the mood with the waltz. All of those look delicious but I'm a chocolate fanatic so anything with that. Did you go to tea time when you went on the cruises? No I didn't…and I don't think I even knew they had them. Now I feel like I missed out on something! I will have to look for that next time. I think my family would also be divided along the gender lines regarding their enjoyment of this tea. Don't get me wrong. My boys and hubby would enjoy the food but not having to act proper and dressing up. I think that the blueberry tarts look absolutely delicious.